Click here for audio of Episode 1423. Today, a young man lets history slip by him. The University of Houston's College of Engineering presents this series about the machines that make our civilization run, and the people whose ingenuity created them. It was 1954. I was a private in the Army, stationed at Fort Monmouth, New Jersey. I was off-duty one hot summer's day, so I walked to the highway and put out my thumb. In my writing case was a thermodynamics text. I meant to find a quiet place to write letters and study Einstein's theory of specific heats. The car that picked me up was going to Princeton. That sounded good. I asked the driver, "Isn't that where Einstein lives?" He allowed it was. I got out at the University, asked where Einstein was, and was told he worked two miles outside of town at the Institute for Advanced Studies. So I walked to the Institute and sat for a long time in the commons room, studying thermodynamics and watching very smart people coming and going. But no Einstein. At length I gave up my ad hoc pilgrimage and started back to town. Where the road turned, I looked over my shoulder and saw a figure two blocks back. The sun behind him cast a brilliant halo through a mop of frizzy white hair. I stalled, watching a golf game, while Einstein himself passed me and strode on into town. I fell in behind him. He walked vigorously, greeting friends and neighbors. Then he stopped and laid his briefcase on a hedge. I was terrified. Did he know I was following him? I don't think so. He was just taking off his blue sweater. As I passed him I saw suspenders over a tee shirt holding baggy trousers. He wore sandals -- no socks. That much fit the stereotype. What didn't was his substance. He was then seventy-five with less than a year to live. But he had an earthy muscularity. He had physical grace, strength and coordination. How many people know he was a good violinist? Einstein was more than airy energy and light; he had mass and physical presence as well. My now-battered thermo text sits on my shelf without Einstein's autograph in it. I was far too shy, unformed, and uncertain to speak to him. Three years later, by a fluky coincidence, I designed an apparatus for his son, civil engineer Hans Albert Einstein. I didn't mention Princeton to him. Six years afterward, I met his granddaughter. Didn't mention it to her either. A lifetime later, the other famous names of that epoch -- Eisenhower, Chiang Kai-shek, Churchill -- they all fade against the light, energy, and mass of that quiet man, standing by a hedge, juggling stars and forces and fields in his head -- that man who made us understand that the world is more than it seems to be. I went on to learn about Einstein's statistical mechanics, his theory of Brownian motion, Bose-Einstein condensation. I learned about his philosophical ambiguities, contradictions and complexities. But overwritten on all that is, for me, a neighbor greeting other neighbors and smelling the roses. My Einstein will always be that scruffy old man on a summer's day in Princeton -- that gentle man who surely would have autographed my thermodynamics book. This is a greatly revised version of Episode 56. For information on Einstein as a historical figure, see Episodes 524 and 526. 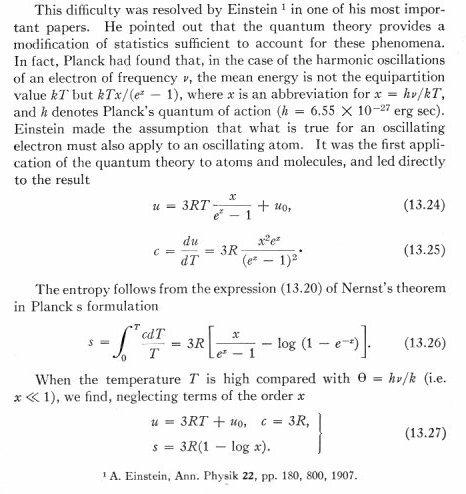 The thermodynamics book in my writing case was Epstein, P., A Textbook of Thermodynamics. New York: John Wiley and Sons, 1937. It is a superb old book to which I still make recourse today.